I n San Miguel de Allende, there is certainly no reason to go hungry! There are San Miguel restaurants for every possible taste and budget. You could spend a month, eat every meal of every day in a different place, and still not try them all. You can also eat your way around the world. Chinese, Lebanese, Italian, American, Argentine, Uruguayan, Thai, German, French, and, oh yes, ...Mexican restaurants greet you on practically every corner. You can eat, drink, munch, snack, sip and dine elegantly or casually in this cornucopia of San Miguel restaurants. In general, Mexicans still eat their main meal of the day at mid-day. This is called comida and is usually eaten between 1:00 and 3:00 pm. It's a big meal enjoyed in a leisurely fashion. Many San Miguel restaurants—especially those catering to a predominantly Mexican clientele—will offer a comida corrida. This is the daily special, the Mexican equivalent of the "blue-plate special." It usually consists of soup or salad, a choice of two or three main dishes, generally served with beans and rice, dessert and coffee, tea or a fruit water like limeade or mango water or the delicious jamaica, a refreshing drink made with dried hibiscus blossoms. This can often be a very good deal if you're trying to eat on a budget. It's also a healthier way to eat, as opposed to the common "light-lunch-heavy-dinner" we often choose North of the Border. 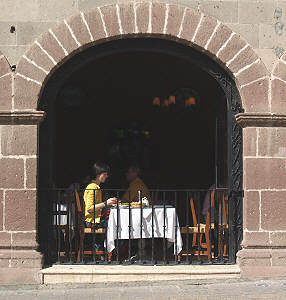 In this section, we'll introduce you to some of the "best" San Miguel restaurants. But how do you define "best"? Pretty tough job, when there are so many different types, flavors, service levels, price ranges. So let's change that to "favorites." Here are some of my personal favorite restaurants in San Miguel de Allende. These are the ones I find myself going back to over and over, places where I'm comfortable, where I like to meet friends. Places where I like the food and I think the prices are fair. Most of them have been around for a long time—not a bad criteria for picking the best. There must be a reason they keep on keeping on. A couple are new but look like they'll be keepers. NOTE: This is a dynamic page. I'll be adding restaurants to this list all the time, so keep checking back to see what's new. Insiders' Tip: To get the most out of your dining-out dollars (and pesos), join the VIP Club of San Miguel. Your membership card will save you a hefty percentage on meals and drinks at dozens of San Miguel restaurants—as well as many other services and products in town. It's the best bargain in San Miguel de Allende. Other People's Favorite San Miguel Restaurants? Over time, I'll be adding more of my own recommendations and notes about my favorite San Miguel Restaurants. The more I try...and love...the more I'll tell you about. But I'm only one person and I can't eat everywhere! So click here to read about some other visitors' favorite San Miguel restaurants. And then please join in! Have you had a mouth-watering experience at a San Miguel restaurant? Share it with us here.